The Seven Last Words of Christ—Terremotto IV (after Haydn) by Tim Rollins and K.O.S. directs our contemplation of Christ’s passion on the cross by slowing us down. Designed to clear our minds of the ambitions that drive us and the concerns that weigh on us, this work focuses our attention on the eternal consequence of Christ. The Seven Last Words of Christ challenges how we approach works of devotional art. When we say that a work of art encourages us in spiritual meditation, we often mean that its subject gives us something to think about. For example, Matthias Grünewald’s Crucifixion in The Isenheim Altarpiece confronts us with the physical and spiritual gravity of the event. Nevertheless, we should not forget that this Crucifixion was the “closed” state of the altarpiece. This work was designed with moveable wings, which opened to reveal other panels, including a glorious Resurrection. Today, the disassembled stages of the altarpiece are all on view together. However, we were not meant to see the Crucifixion and Resurrection simultaneously. The work was designed to be engaged over a period of time. The very structure of the altarpiece was meditative; it required patience. Since the wings were only opened on holy days, the viewer had to wait for the resurrection to be revealed. This waiting time was part of The Isenheim Altarpiece’s function as an instrument of spiritual training. Grünewald’s work was designed to actively change you, not just provide a passive moment of reflection. Time is also an important dimension of Franz Joseph Haydn’s musical score. Haydn’s The Seven Last Words of Christ cannot be heard all in one moment. Performances of the entire score, which has seven main sections as well as an introduction and “earthquake” (terremotto) conclusion, take longer than an hour. In time, the composer takes us on an emotional and spiritual journey. Employing one page from each section of Haydn’s score, Rollins and K.O.S.’ The Seven Last Words of Christ is composed of nine panels. (Painting on pages, either book pages or a musical score, is a signature element of Rollins and K.O.S.’ art.) Each panel is painted in spinel black. Black spinel is a rare gemstone that has associations with fidelity and devotion as well as the consolation of melancholy. As a crushed pigment, spinel black has a rich matte surface. Each panel is painted leaving a vertical strip that is left unpainted down the middle of the panel. We can call these “zips” to acknowledge their kinship with the art of Barnett Newman, specifically his well-known series Stations of the Cross. The “zip” can be read simultaneously as a white form standing against the void and as a tear in the black form. In the first reading, the “zip” could be a surrogate figure of Christ or perhaps a visualization of Christ’s words cried out into the darkness. In the second reading, the “zip” may evoke the renting of the temple veil at the hour of Christ’s death. Perhaps this severance reminds us thatGrünewald designed his own image of Christ to be ripped apart when the altarpiece was opened. The confrontational iconography of The Seven Last Words of Christ is richly personal and gripping; each viewer finds something new in it. The entire work, nine panels hung in a row, is 271 cm long. Each panel is 23 cm wide. The panels are separated by spaces of 8 cm. These spaces are significant to the work. They are visual pauses between each panel; breaths between each saying of Christ. The structure of The Seven Last Words of Christ requires that it be seen “in time.” It is not possible to read this work from one single place. We stand back to take in the entire work. We approach each panel individually to read what remains discernable of the musical score. The succession of panels moves us corporally. In The Isenheim Altarpiece, the physical pose of each figure evokes certain states of spiritual being. The Seven Last Words of Christ employs our own bodies, as its composition directs our movement, to develop our spiritual contemplation. Echoing the time-based structure of Haydn’s music, Rollins and K.O.S. have created a work that restores important aspects of duration and direction that have often been deemphasized in works of devotional art which encourage passive, momentary, and undirected reflection. We don’t often encounter contemporary devotional art that addresses the method of our meditation. The Seven Last Words of Christ affects us, just as The Isenheim Altarpiece altered the late-gothic worshiper. Rollins and K.O.S. are true heirs of Grünewald and Newman. Particularly in this season of Lent, The Seven Last Words of Christ urges us to take the time to contemplate Christ’s passion. Tim Rollins and K.O.S. 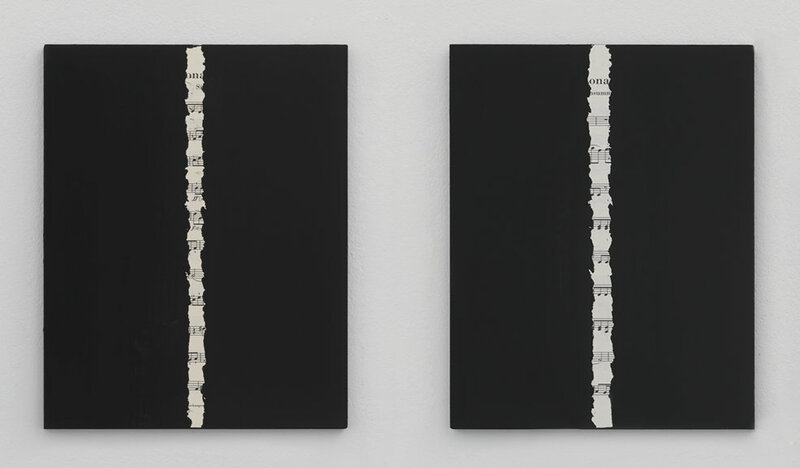 : The Seven Last Words of Christ—Terremotto IV (after Haydn), 2013, black spinel pigment, casein, music score pages on wood panels, 30,5 × 271 × 1 cm. Courtesy: The Artist and Xavier Hufkens, Brussels. Photo-credit: Allard Bovenberg, Amsterdam. James Romaine is Associate Professor of art history and chair of the Department of Art History at Nyack College, Nyack, NY, USA. He is the president and co-founder of the Association of Scholars of Christianity in the History of Art (ASCHA). See http://christianityhistoryart.org.